After a brief transit in Beijing, it was just a 2 hour flight to Ulaanbaatar, the capital of Mongolia. Having travelled to Beijing and China a few times over the years I thought I would get a head start and begin my journey in UB city as the locals call it. The landscape transformed from the vast nothingness of the Gobi to lush green plains and mountains. As we came into land I could see distant clusters of white spots and realised they were Ger camps. I met my transfer and off we went, windows down, a hot sunny day of around 35 degrees. My driver Toma was dressed in shorts and a T-shirt. It was a Saturday and the traffic was light, we cruised into the city past the enormous Chinggis Square to my central hotel. I checked in and had a bit of a rest although with only an hour’s time difference from Melbourne I felt pretty good. Had an early dinner then went to see the “Mongolian National Song and Dance Academic Ensemble”. A great mix of traditional dancing, singing, contortionists and full orchestra as finale. The throat singing was amazing and the costumes vibrant. 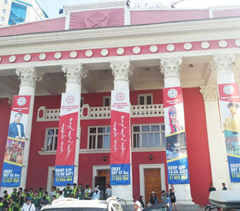 A fast paced and varied show, it was a wonderful introduction to the rich culture of Mongolia and a must see for anyone visiting UB during the summer. Woke early and met Toma and my lovely guide “Yesulen”. After a quick stop at a bank to change some US Dollars for Mongolian Tughrik, we drove out of the city along Selbe River towards Terelj National Park. Lots of families out enjoying the sunshine, swimming and having picnics on the river bank. We made a stop at the enormous Chinggis Khaan Equestrian Statue, very impressive. The shiny stainless steel glistening in the sun. Took the lift to the top and walked out onto the horses head for a great view back towards Chinggis’ fearsome face and a panoramic view of the surrounding countryside. After a visit to the museum in the basement we continued into the beautiful National Park with a brief photo stop at Turtle Rock and to our Ger camp for lunch. 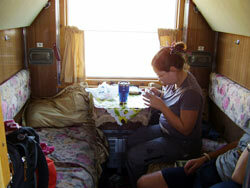 Normally we recommend clients spend 1 or 2 nights at the tourist Ger camp depending on the season. There are a range of private twin Gers and the shared bathrooms are kept sparkling clean. Late May to mid September is the best time of year for warmer weather, however the camp is open year round. Nb. The bathroom facilities are only operational during summer. Delicious local food is served in the large restaurant Ger. The setting is really spectacular, the camp is nestled in front of a jagged outcrop or rocks with sweeping views of the valley in the other direction. Available activities include horse riding, archery and guided walks. Alternatively it’s a great place to just relax and take in the beautiful scenery. After lunch we visited an elderly grandmother in her nomadic home. She was very welcoming, offering tea and biscuits. My guide Yesulen translated, she proudly showed me photos of her extended family spread across the globe and I showed photos of my boys – “very pretty” was the response. It was a lovely exchange, then we said our farewells and started the long drive back to UB city. 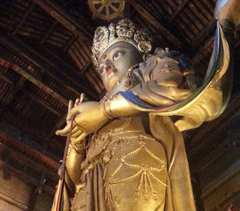 Our city tour began with a visit to the Tibetan-style Buddhist Monastery of Gandan. The monks start their chanting from around 9am each morning. Having not travelled to Tibet I had never seen or heard anything quite like it. This complex is vast and you need around 2 hours to see it all. We then visited the National History Museum which is excellent. 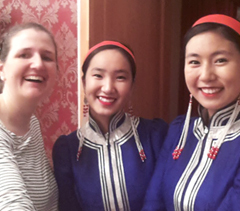 I particularly enjoyed the traditional costumes and musical instruments. This is a really great museum. Again, allow around 2 hours to have a good look around. There is some English but having a guide really made it a much more interesting and informative visit. After a walk around Chinggis Square in the hot sun we had a delicious lunch at Modern Nomads Restaurant. Then it was time for some shopping at the National Department Store. The top floor has an wide range of souvenirs for sale, and there is a large supermarket on the ground floor which was handy for stocking up on food for the train. I also visited a fair trade shop nearby called “Mary& Martha Mongolia” which had the most beautiful handmade wool and cashmere products. 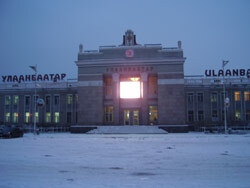 After we finished shopping in the late afternoon we drove to Ulaanbaatar Railway Station. Train #263(361) leaves UB each evening just after 9pm. It’s a comfortable modern train and I was travelling 2nd class in a 4 berth cabin with 3 other travellers. Unlike most trains in this region, there is no dining carriage on this train and I had packed more than enough food to last the journey (our guides will take you to a supermarket en route to the station if you wish). 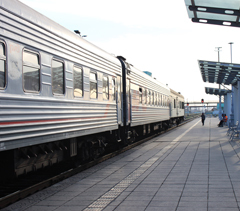 Most travellers take this train all the way to Irkutsk, but I was only travelling as far as Ulan Ude. The section between from Ulan Ude and Irkutsk closely follows the edge of Lake Baikal and I wanted to see it in the daylight hours. If I stayed on this train that part of the journey would be in darkness. Had a reasonable sleep in my upper berth, though it was quite noisy, my ear plugs came in handy! Our train reached the Mongolian side of the border at around 6.30am and we stopped. Most of the train continued sleeping, it wasn’t until around 9.30am that Mongolian passport control came on-board. The toilets in our carriage were locked the whole time, for those that still had some Mongolian Tughrik there were toilets in the station available for a small fee. Around 11.15am we started moving again, crossed into Russia then stopped again. Clocks back an hour, then the not so friendly Russian passport control came on board. Lots of forms and taking/giving of passports, checking inside bags etc. Our very serious Provodnik (male attendant) announced that we would depart at 3pm. We all had to leave the train until then. The station had plenty of cash machines dispensing Rubles, there was a small shop and toilets available for a fee…Rubles this time. So we waited and wandered and finally were moving again just after 3pm (a total of 10 hours to cross the border!). The journey on to Ulan Ude was really lovely…lakes, small towns and rolling hills. The evening light was beautiful as we trundled along. We arrived in darkness at 9.30pm and I was very pleased to see my transfer on the platform holding a name card before I even stepped off the train. We drove to my central hotel where I had a hot shower and a big sleep. In the main square of Ulan Ude is a massive statue of the head of Lenin. It’s the largest in the world. I could see a sideview from my hotel balcony which was strangely cool. It was raining heavily in the morning, I had planned to go take a closer look at Lenin but the weather changed my mind. And my transfer was anxious to get me to my next train so off we went (normally we offer 2 nights in Ulan Ude but I was on a tighter than normal schedule). Onto train #69 which was older in style but still very comfortable. Most of the people travelling were Russian, I didn’t hear any English the whole day. It was great fun, lots of kids playing in the corridor and everyone was very friendly. The second half of the 8 hour trip to Irkutsk was right along the edge of Lake Baikal, only metres from the water in some parts. I was so pleased to be seeing this in daylight hours. It was a really stunning sight. Then the train curved away from the lake and up into the hills towards Irkutsk…as we climbed we enjoyed panoramic views of the lake looking back. Even the locals were taking photos. Then it was plenty of pine and silver birch for the last bit and we arrived into Irkutsk in the late afternoon. Met by my guide Sergei who took me to a home stay and arranged to meet me the following morning. An interesting homestay, I was met by Lucy and she showed me around the apartment. Lots of postcards and trinkets on display from past international visitors. I added a bag of Jaffas and a couple of Aussie fridge magnets to the collection. The family really enjoy speaking English and learning about other cultures. I had my own bedroom which was very comfortable. In the morning we shared a traditional breakfast of pancakes with various sweet and savoury toppings along with lovely berry tea. We had a nice chat then I was on my way with Sergei to see some of the sights of Irkutsk. First stop was the main city square and the Angara riverfront. Had a look at the Cathedral of the Epiphany then drove to the Znamensky Monastery. The flower garden there was gorgeous and it was a nice mild day of around 18 degrees. Next was a visit to the Decembrist Museum which was really fascinating, then a walk along “130 Kvartal” a fashionable pedestrianised shopping street full of restaurants and bars. 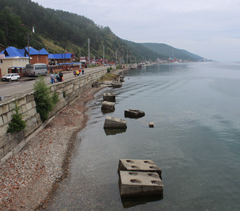 Drove to the ferry terminal and took a hydrofoil down the Angara River to the village of Listvyanka on the edge of Lake Baikal. It was a lovely way to arrive at beautiful Lake Baikal, the deepest lake in the world. A taxi and guide drove me to my chalet accommodation. My host Maria made me feel very welcome and I took it easy relaxing in my delightful lake view balcony room. Dinner at the chalet was delicious steamed Omul fish (fresh from the lake) with fried potato with herbs and vinegar. And a warming shot of vodka; Maria stood over me until it was consumed! No pressure! Met my guide and driver in the morning and we took a look around the Listvyanka fish markets and I bought some souvenirs. Dipped my toes in the lake which was chilly but refreshing…and so clean, Sergei insisted that I had extended my life by about 5 years in doing so although I’m not convinced this would be confirmed by the medical community. Next stop was St Nicholas Church where we heard some lovely singing and explored the gardens. Then on to the Baikal Museum which was really fascinating. The diversity of plant and animal life around and in the lake was a real surprise to me. This is a great museum and I really enjoyed it. On the way back to Irkutsk we stopped at Taltsy Wooden Architecture Museum. All open air and set in woodland not far from the Angara river, the museum is a continually expanding collection of timber buildings documenting the history of Siberian architecture and of Russian life in general. There were some great market stalls and delicious pastries for sale. Another great museum, you could easily spend the whole day here. However I was on a tight schedule and had a train to catch so we continued our drive back to Irkutsk. Spent a bit of time in a supermarket making purchases for the long train journey ahead! Sergei took me to the station for my early evening departure train bound for Ekaterinburg. Back on train #69, sharing a 4 berth cabin with Rita and Igor her 6 year old grandson (travelling to Omsk) along with a young student Marsha (traveling to Krasnoyarsk). Plenty of kids running about and I handed out some Australian animal fridge magnets which kept them happy. Finally worked out a more efficient system of packing, so less rummaging about! A plastic bag for toiletries and another for food, then the rest of my daily essentials in my handbag. And of course a money belt with passport, credit card and cash on me at all times. Probably a bit over cautious, but better to be safe than sorry. Plenty of power points in the hallway (2 round pin) but none in the cabins. Smart phones and tablets plugged in at every available point. I went for a meal in the retro dining car. It was like stepping back in time – a mix of fabulous green vinyl and shiny chrome. 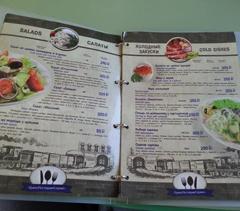 A pretty decent menu but quite expensive by Russian standards. So I dined alone, the locals had obviously packed their own food for the journey. I only had the one meal there during the 55 hour trip. We stopped frequently, every hour or two. At major cities there were usually kiosks on the platform with drinks and snacks for sale. And ladies pushing trolleys full of goodies along…bread, fruit, water, chips, sweets, pot noodle etc. Without knowing much Russian it was difficult to predict how long we would be stopped at each place. So I did not venture far. No warning at all for leaving, the train would just quietly pull out of the station. I used the “samovar” boiling water urn for coffee and pot noodle along the way. Black tea with sugar served in traditional Russian Railways tea glass holders was the drink of choice for locals young and old. With plenty of sweet biscuits for dipping. No sign of any vodka, much frowned upon and discouraged by the attendants. There are no showers on board, the toilets were kept quite clean and I made use of my travel towel and a Sigg bottle filled with slightly cooled boiling water to freshen up. Towards the end of the trip some ladies in the cabin next door to mine started a singalong with a guitar which was great fun. Finally we made it to Yekaterinburg, local time 10pm. My transfer and guide Demitri drove me to a lovely hotel and I had a well deserved shower. Had a magnificent sleep in a comfortable bed, hooray! Then a hearty breakfast and met my walking tour guide Julia. Sunscreen, hat and sunnies…forecast of 30 degrees, phew! We walked all over the beautiful city centre of Ekaterinburg. A city grid with plenty of trams, it quite reminded me of Melbourne. Along the river and saw some cool street art and sculptures – particularly liked the keyboard QWERTY monument. Then to the wier on River Iset and past the stunning “Sevastyano’s” house. Saw lots of crumbling Russian constructivist Modern architecture and a few surviving classical and baroque theatres. Through lovely parks and gardens, past the Afgan war memorial and finally to the Church of the Blood built on the site where the last tsar of Russia and his family were killed. Visited the very interesting and sad exhibition about the Romanov family inside. Took it easy in the afternoon, I was tired. Ekaterinburg is located on the border of Europe and Asia and is a fascinating melting pot of cultures. It is vibrant and artistic and the people are so proud of their beautiful city. It’s a centre for industry, education and the arts. I highly recommend breaking the journey here for a couple of days. So this is where I had to cheat a little. With limited time I was up at 4am for a flight to St Petersburg. Clocks back 2 hours, met my very polite transfer guy and off we went. What an amazing city, everything super sized. I had high expectations of St Petersburg but it still left me speechless. Arrived at the lovely Helvetia Hotel and left my bags with reception. My local guide Natalya joined me and we walked along Nevsky Prospect, the main road through the city centre. First stop was Eliseevs Food Hall which was really stunning. Cakes, vodka, caviar and chocolate truffles! Then past Kazan Cathedral and along the canal to Savior on the the Spilled Blood, a magnificent building. 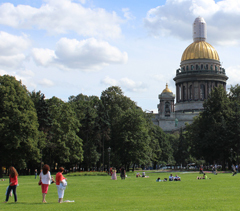 An ice cream in Mikhailovsky Gardens with a great view to The State Russian Museum. Through the Field of Mars and saw the Eternal Flame before heading to Palace Square and my first view of the Hermitage. Lots of photos, then a trolley bus back to the hotel for check in at 3pm. A great introduction to the city, feeling pumped for day 2. Up, breakfast and walking Nevsky Prospect by 8.30am. Had my online voucher for the Hermitage at hand and was first in the “internet ticket” queue at 9.30am. Straight in at 10.30am and into another world. Rented an audio guide which was handy. With so much to see I wandered from one room to the next taking it all in. So long as I kept moving I could stay ahead of the pack. Sometimes I was the only person in the room, but when I looked out the window I could see thousands queueing at the main entrance. So getting there early with an online voucher is the way to go! By around 2pm the museum was packed, I stopped for a quick lunch at the museum cafe then left and walked along the Embankment to see the Bronze Horseman then through Alexandrovsky Gardens and past Isaac’s Cathedral. A lovely sunny day in a beautiful city. Spent some time in the Singer Building bookshop which was great, then walked back to my hotel. The weather turned. Took a trolley bus up Nevsky Prospect in the rain with my guide Natalya to the Lion Pier where the hydrofoils depart for Peterhof. Bit of push and shove to get onboard. Great views of the city, shipyards and cruise dock along the way, in just 30 minutes we arrived. Walked along the canal to the magnificent Palace and Grand Cascade of fountains in front. Shiny gold statues and water spraying everywhere, quite spectacular. Lots of photos of course! There were so many tour groups milling about, it was well worth pre-booking the tour with guide. Natalya had early entrance tickets for us so we jumped the queue and in we went. A very interesting tour of the palace, each room in a dramatically different style. Then we explored the beautiful manicured gardens and fountains. Lovely walk along the waterfront, then returned to the city by hydrofoil. A trolleybus back to the hotel and out of the rain. Up early and packed. Checked out and had breakfast, then walked to the station for my high speed Sapsan train to Moscow. Took a little while to find the main station which is tucked behind a shopping centre and quite mixed up with the metro network, so I just asked some security police and they pointed me in the right direction. A grand soviet interior, I found the platform easily and watched the sleek train glide in. I travelled in economy which was very comfortable. Only a 4 hour trip, the train reached speeds of 220km per hour. Some pretty scenery whizzing past the window. A very convenient and inexpensive way to travel between these two great cities. Arrived Moscow and met my transfer; the traffic was horrendous. Lots of road works, it took over an hour just to get to my hotel. Left my bags at reception and met my guide, another lovely lady called Natalya. We walked around the Kremlin wall to Red Square and GUM Department store, also took a look at the Bolshoi Theatre facade. Then down into the Moscow metro system and visited some stunning stations. 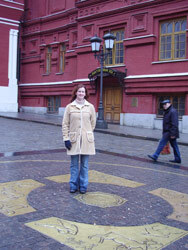 On the way back to the hotel, Natalya showed me where to meet her for the Kremlin tour the following morning. Walked to the Kremlin wall to meet Natalya. There was a very long queue for ticket sales already and a ridiculously long queue to enter the main complex. I was very pleased to have Natalya with me, there were a lot of frustrated people and the atmosphere outside was tense to say the least. She had our pre-booked tickets ready and we quickly hopped in the separate entrance queue for the Armoury. We still had to wait for around 45mins, mainly because the security guys moved at a snails pace. But once we were in it was really great. The Armoury was definitely the highlight, quite stunning. Then we saw by chance a military parade of guards on horseback and a marching band. 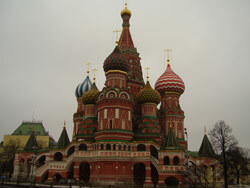 After we visited some of the Cathedrals we saw the enormous Tsar Bell and Cannon. 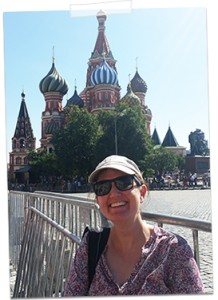 The gardens were quite lovely and we took the Spasskaya Tower exit straight onto Red Square and I got my first proper view of Saint Basil’s Cathedral…wow! 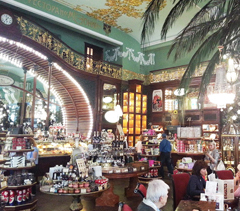 Finished the tour then went for a very Russian cafeteria lunch at “Stolovaya 57” in GUM Department store. Back to the hotel for my last evening in Russia, bought some beers and watched the Olympics on TV. Russia won the badminton. My last day in Russia! I walked to Old Arbat shopping street for some last minute souvenir shopping. Bought a lovely set of matryoshka dolls and a Putin fridge magnet. On the way back I stumbled upon a toy store and was delighted to find some miniature Russian trains for sale so bought them for my boys. All shopped out, I returned to the hotel and checked out at midday. Took my transfer to the airport and was off to Dubai with Emirates. Then a lovely flight with Qantas direct to Melbourne, first time on an A380 it was very comfortable. An amazing trip but great to be home and see my family. 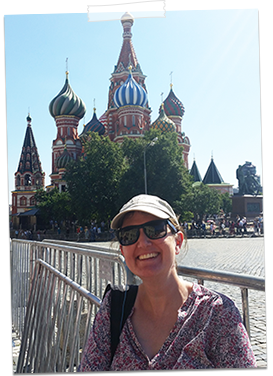 Arrived in Moscow by train with Tsars Gold about midday, said my goodbyes and left the tour in Red Square after our Kremlin tour. Walked to the Metropol Hotel…I have booked many clients into this historic hotel and I was super excited to finally stay myself. For such a magnificent hotel it is quite reasonably priced. The location opposite the Bolshoi Theatre is second to none and the dining hall is out of this world. I checked in and binged on the free wifi before heading out for some dinner at a funky burger café round the corner. Early night in my lovely room. I have had some impressive breakfasts in hotels over the years but this one takes the cake (or caviar in this case). The dining hall at the Metropol really is a masterpiece. This hall has seen the likes of Sofia Loren, Bernard Shaw, even Mao Zedong. Lenin delivered speeches here and Michael Jackson played the piano. The stained glass dome and marble fountain create the illusion of a sun-lit garden. During a lavish breakfast a harpist plays on the stage….and of course there is champagne, smoked salmon on offer. After breakfast I took a car transfer to the station to meet my guide for the day Katya. We travelled by regular suburban train which was interesting. Fairly basic but clean and comfortable, windows open for a nice breeze. We arrived at Sergiev Posad and left my luggage in storage at the bus station. A leisurely walk in the sunshine to the Monastery of St Sergius, we stopped to fill our water bottles with holy water at the ancient well chapel. Ice cold spring water from deep underground and quite safe to drink. Up to the Monastery entrance and met our official guide Svetlana who showed me through the incredible complex. So many devoted pilgrims, stunning blue skies and golden domes glinting in the sunshine. I am not a religious person but this is one of the most revered monasteries in Russia and UNESCO-protected. The sheer beauty of the architecture and hilltop setting had me speechless. After our tour we had a hearty lunch in the cool basement refectory then wandered by the pretty lake and back to the station. 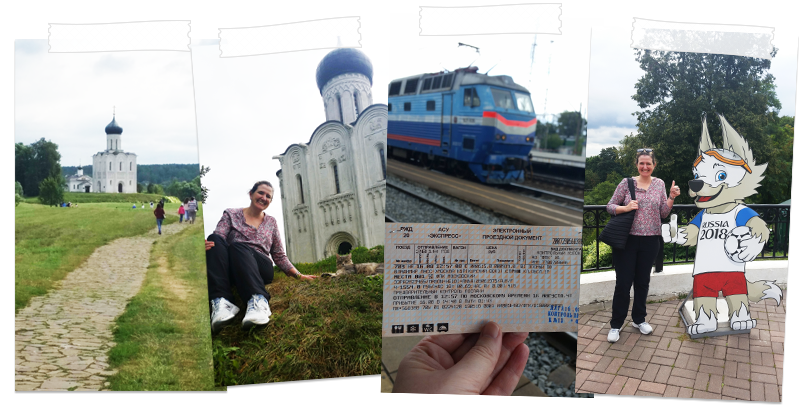 Katya gave me my onward ticket and put me on the train to Yaroslavl. A modern fast train, I had a first class seat and meal included. The trip took 2 ½ hours and was very comfortable. Olga was waiting for me on the platform when I arrived and she drove me to the lovely Boutique Hotel Modern in the city centre. Back on hotel wifi and had an early night. After breakfast I met with lovely Olga for a 3 hour walking tour. Another sunny day, although a bit on the windy side. We walked all over the beautiful city centre. 11th Century Yaroslavl is one of the oldest cities in the country and its historic centre is a UNESCO World Heritage Site. I climbed the belfry in the Spassky Monastery for wonderful 360 degree views and then we walked along the Volga River embankment where river cruises dock regularly during the summer months for shore excursions. As someone interested in Architecture this city is a delightful place to walk around, so many churches, theatres, wide tree lined boulevards and imposing Soviet era buildings. All this but with quite a relaxed vibe in contrast to the frenzied pace of Moscow. And even in contrasts with some other Golden Ring towns Yaroslavl doesn’t feel very touristy at all. After my tour I walked back to the hotel and to a local café for lunch. In the afternoon I explored the city further and bought some souvenir enamel tiles to remember my visit. Bit of a sleep in and late breakfast. 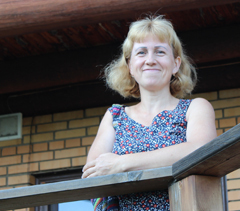 Olga picked me up at 11am and we drove about one hour to Rostov Veliky on the shores of lake Nero. The beautifully restored Kremlin dates from the 17th century. Olga took me on a guided tour of the picture postcard complex…followed by a delicious borscht lunch in the attached dining hall. We visited an enamel factory and I was delighted to purchase a traditional Rostov Finift ring. A quick visit to the Spaso-Yakovlensky Monastery right on the edge of the lake on the towns outskirts then I said goodbye to Olga and took a private car transfer for the 2 ½ hour drive to Suzdal. The road was very rough but the scenery wonderful. Arrived in the late afternoon and checked into the Pushkarskaya Sloboda Hotel. A great dinner at “Uley” restaurant and tried the local honey wine which was delicious. Off to bed! My guide Sergey met me in the hotel reception at 10am. Toured by car, sights are a bit spread out for walking. We started at the Museum of Wooden Architecture which was beautiful. Sergei is a local from Vladimir and very knowledgeable and passionate about the region as well as being a very funny guy which was refreshing after so much history! 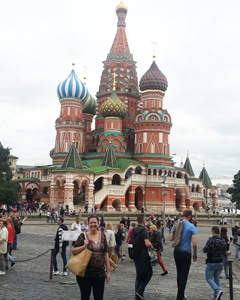 Next stop was the 72 m Prepodobenskaya Bell Tower which I climbed for panoramic views…wow! Then the Kremlin (yes another one) where I heard a choir singing and bell ringing performance. We stopped for coffee and apple pie then I explored the vegetable and herb gardens. On our way back to the hotel we went Lada and Fiat spotting…trying to find the most beat up (but still going) cars, great fun. What a lovely town, so much character and history – love it. No wonder they call Suzdal the gem of the Golden Ring. It is very special. Sergey met me at 9am and we drove to his home town of Vladimir….on a much better road this time, about a 40 minute drive through lovely rural scenery. On arrival we started with a leisurely walk to the very pretty “Church of the Intercession on the Nerl” in the town of Bogolyubovo. Really nice walk through fields along a flat cobbled path (2.5km return) Then we went into the city centre of Vladimir to visit the UNESCO 12th century Golden Gate and climbed to the top for lovely views and an interesting museum. Vladimir has a notable significance in Russian history, as it served as the country’s capital city in the 12th-13th centuries. It was fun being shown around by a local and Sergei took me to some wonderful lookouts with beautiful views over the city and surrounding countryside. Then it was time to head back to Moscow so I said goodbye and was back on a fast regular train. Again very clean, comfortable 1st class seat with lunch included. Trip took 1 hour 40 minutes, sure beats sitting in traffic which is the private vehicle alternative for seeing this part of Russia. Back in Moscow and a transfer to my favourite central 3 star hotel the “Assambleya Nikitskaya” for my last night in Russia. Breakfast at the hotel then a car transfer to Moscow Domodedovo Airport for my flights home with Singapore Airlines. Another wonderful adventure in Russia, so much learnt and I look forward to planning even better trips for my clients on return. 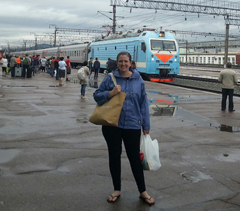 Fiona Elliott recounts her experiences on the Trans-Siberian railway from Beijing to Moscow and gives a few tips about life on the train. My adventures begun with 2 days in Beijing for some sightseeing. First a walk through the Forbidden City where the Emperors from the Qin, Ming and Qing dynasties ruled for thousands of years and then across Tianamen Square where Chairman Mao now rests. Don’t forget to fit in some shopping at the Silk Markets, where you will here cries of “I got some nice watches lady. You want some? Cheap!” and “My price cheap!” followed with “Ok Ok what’s your price?” Prada sunglasses for 7 Aussie dollars, I should have bought more. At night the streets come alive with markets and food vendors. Fancy trying some fried grasshopper or maybe a scorpion? Then head down to Foot Street not far from the Forbidden City to try all these Chinese delights and more. 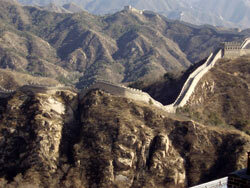 A visit to the imperial capital is not complete without a visit to the Great Wall of China. It is 6000 kms long and was built 3000 years ago. You want believe it until you see it. Although the train does pass the wall it does not stop (its not for tourists) so you need to take a day trip to see it properly. And indeed if you want to see more of China than this (and there is lots to see) talk to us about our additional Chinese itineraries. Train no 23 departs Beijing Central Train Station at 7.40am sharp. I boarded the train and found my sleeper for the night. I wasn’t on my own for long as another western couple joined me for the next two days. We stored our backpacks and got ready for 2 days of train living. Each carriage has 9 sleepers with 2 upper and 2 lower beds. There is storage space under the lower beds and above the door. We managed to fit in 3 backpacks and daypacks in the storage areas so we were not tripping over them. At the each end of the carriage is a toilet with a washbasin. They are kept relatively clean by the two attendants who are there for your every need (well sort of; be nice to them. On the train they are very important). A boiler will keep you in supply of hot water for your cups of tea or coffee or pot noodles. If you are a coffee fiend then take your own – trust me, take your own! I was doing this trip in the middle of winter; however on the train you wouldn’t even know it was winter. The train is kept very warm so I was able to take off the thermals and live in a t-shirt. If you do get off the train at stations, don’t forget to rug up! You pay a very small fee for bed-linen which is usually super fresh. Just so you don’t have to rely on pot noodles, this train also has a restaurant car. From Beijing it has a Chinese menu with a plentiful supply of alcohol. The menu is cheap with a plate of beef and noodles about 10yuan, which is about 2 Aussie dollars. The restaurant car also served the purpose of a makeshift “Aussie Pub”. As I was eating my beef and rice another Australian couple sat down for a cheap feed. As we had all spent the last few days in China it was good to speak some English! We got talking and before we knew it 2 more Aussies joined us. The amazing part of this train trip is the scenery and the “real” side of the country you don’t get flying over in a plane. Four hours in, if you look out your window, you will get a view of the Great Wall of China as it stretches over the hills. The train also passes through smaller villages and some industrial towns. A quick run down on the situation with washing. It’s a subject that always get asked by our clients. Well the good news is that many of the Russian trains now have a shower cubicle (please note – we do not guarantee this). 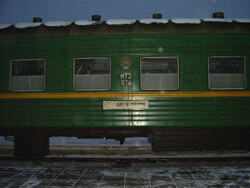 It is situated in the wagon next to the restaurant car and costs about US5 to use. The Chinese & Mongolian sections do not have these facilities. The toilets are kept reasonably clean, have hand-rails and a plug hole in the floor making an improvised wash down very possible. At about 10pm the train comes to a stop at a station called Dalanzadgad. This is still in China. The stop is for 2 hours and for your evening’s entertainment you get to see the changing of the bogeys. The gauge between the tracks changes between China and Mongolia. You are allowed to stay on board and watch or you can get off. A couple of my companions got off and mentioned it was the highlight of their evening. The restaurant car closes at 8pm so if you don’t get off the train then you will have to retire to your cabin. I was going to get ready for bed but this is also where the customs and passport procedure takes place. Unlike Australia where we do not share any land borders, you tend to forget that you are about to enter a different country by train. Just like at airports there is the official passport collecting and stamping procedure. game to go through. Lots of paperwork and forms to fill in. By about 1am I was asleep with the gentle rocking of the train. The following morning I headed to the restaurant car and was greeted by a new restaurant! While they were changing the bogeys they also change the restaurant!. As we were headed for Mongolia it became a Mongolian restaurant. Accepted currency on board was Yuan from Beijing and Turgitst from when we crossed the border. US dollars is always accepted. It is advisable to bring more $US, as you can’t change currency until you get to Ulaan Baatar. Having said that, Yuan was accepted in the Mongolian restaurant. After two days of playing cards and drinking vodka and Chinese beer we arrived in to Ulan Baatar, the Capital of Mongolia; the most land locked country in the world. I was meet at the station by my guide and whisked off to a Ger Camp for the next 2 days. A Ger is made out of camel-felt and are effectively, tents. About 70% of Mongolians are Nomads and live in these tents. At the end of each season they pack up the tents, families and herds and move on. 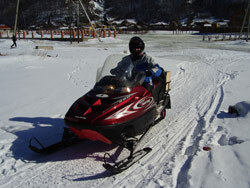 Elesti Ger Camp is located 1 hour from Ulaan Bataar. It is a traditional camp experience. Very quiet and relaxing. A Ger will sleep up to 4 people. Inside the Ger is a heater to keep you toasty warm in winter, a table and chairs and a washbasin. All meals are included. 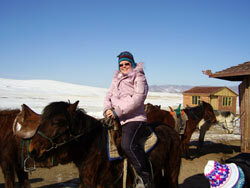 My favourite activity at the camp was horse riding on Mongolian horses. Yes, they are different to other horses- they are smaller, just a bit bigger than Shetland ponies. My horse didn’t go extremely fast but he picked up the pace when required. The next activity was horse sledding. Like dog sledding but with horses obviously a winter activity, as you need snow! Other activities at the camp include archery, hiking, visits to other Ger camps and Nomad communities. Before boarding the train I spent one night in Ulaan Bataar to explore the city. It’s not a big city unlike its neighbour Beijing but there is enough there to keep you amused. It may be a smaller city but there seems to be more cars then people! No indicators, nobody bothers to give way and when crossing the road even at the designated pedestrian crossings – run! Because they don’t stop! My guide took me on a walking tour starting at the Gandan Monastery were you may hear Monks chanting and people wishing for their good fortune for the New Year and on to the city square. Here you will meet the Mongolian National Hero, Ghengis Khan. The big man sits on the steps of the parliament building facing the city. I can also recommend the National History Museum for history in a nutshell. A late dinner of Mongolian BBQ and a couple of Ghengis Khan brand beers and I was ready for a good nights sleep. The following evening I boarded train number 253. This will take me to my next destination and third country; Russia. I will have two nights and 1 full day on this train. Again, I will not be alone as my English friends will also be on the train with me. Although the trains were dominated by locals, there is usually a few western travellers on board especially during the northern summer. We left at 6.40pm sharp! With four of us in this cabin we stored the backpacks and extra bits and settled in for a game of cards and a couple of drinks. The setup on this train is the same i.e. toilet at each end, hot water on demand, the only slight change is that there is no restaurant car. Before I left I stocked up on supplies of pot noodles, tea bags, instant coffee and vodka. Next stop was the first station over the Russian border. Russian passport control took place here. This took approximately 2.5 hours. The toilets on board were closed so we ventured out to use the station toilets, which you had to pay for. Unfortunately, they only accepted Russian Roubles and I didn’t have any. So back on board to wait until we got going to use the train toilets! Let me explain the train toilets. Like washing on-board it is a subject everyone likes to ask about. It is a proper toilet with a flush action. There is no sewerage therefore when you flush it goes straight on to the track. Therefore 20 minutes before the train arrives at a station the toilets are locked. For obvious reasons. The entertainment on board come courtesy of a little Mongolian boy. He had perhaps never seen western folk, let alone four at once. He became quiet fascinated with us and would stand at the door listening to us chat. When we looked at him, he would run off and peep around the corner. This went on for hours! More card games and vodka took us through the afternoon. We all had plenty of food too, so we didn’t starve. Another night onboard and we arrived into Irkutsk the capital of Siberia, at 8am. It was -22 degrees C. For me this was the coldest I had experienced ever in my life. Its colder than a Hobart August night! From here all three of us went straight to a village called Listvyanka one hour north. This was to be home for the next 2 nights as I was doing a home stay option. This is where you get to stay with a Russian family in a traditional Siberian home. 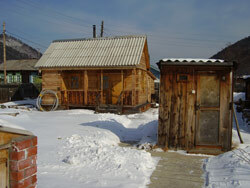 The homes in this area are called Izba, a log-timbered house. The house is built around a brick stove that heats the house as well as serving as the stove to cook meals. As there is no pipes because they freeze over in winter, there were no showers or indoor toilets either. Traditional in Russia is a banya or a dry sauna. Very cleansing as you sweat it out then have a wash down. Staying with a family is great way to learn the culture and see the sites. My host was a great cook. I tried borsch soup for the first time and loved it. As you are free to come and go as you please, it was very relaxing and my host was easy going. 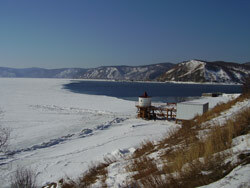 The village of Listvyanka is located in the Lake Baikal National Park. Lake Baikal is the largest fresh water lake in the world and the oldest at 20 million years. One quarter of the world’s fresh water lies in this lake. It also has the only fresh water seal and his home to fifty different fish species. It completely freezes over in winter (although there are reports that last winter was the first time that it did not completely freeze). Activities in the summer include fishing on the lake and walking around the lake and in winter you go across the lake on a snowmobile. Two days and 3 nights in the village without a television, Internet or phone. You are made to relax and think about life. 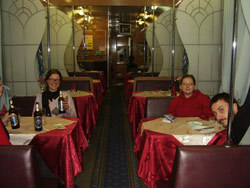 After one night back in Irkutsk it was back on the train for the long stretch to Moscow with my English friends again. Train number 53 left a 4.30pm Irkutsk time. Throw your watches away as you go through up to 7 different time zones as you travel across 2000kms of Russian country. All trains run on Moscow time, which is 5 hours behind Siberian time. The clocks inside the train are also on Moscow time! The food on board was certainly not great Russian cuisine but we had had enough of pot noodles and cupa soups to last the trip. More card games were to be had along with plenty of reading. There were a couple of MP3 players and speakers between us so that was one source of entertainment. Our other source of entertainment come from practising our Russian on the attendants who didn’t speak English. It was obvious we didn’t speak Russian but that didn’t stop them telling us off for trying to use the toilets at stations or using their sink to wash our cups. You make your own fun. At 5.30pm Moscow time we arrived into Moscow. As always my driver was at hand to whisk me off to my hotel for a good night’s sleep. The first thing to do in Moscow is to ride and learn the metro system. It cris-crosses and connects over 100 stations and carries more than 4 million people a day! The second thing to learn is Cyrillic alphabet. 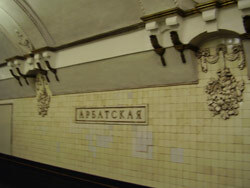 All the station names are written in Cyrillic and most of the streets too. Some streets do have the English translations. It is not too hard once you understand that B is pronounced V and P is R. The funny square shape is D and backward upside L is G and H is N. Easy. Oh that was my stop. The good thing is if you do miss your stop, then you just cross the platform and catch the next train in 90 seconds to go back the way you come. So much to see. I had 2 days of sightseeing. My first morning was spent with a buddy/guide who took me on a walking city tour. There is so much to Moscow history that if you don’t know any of it – like me, then you will miss the importance of buildings and statues. The only one I was familiar with was the Bolshoi. Or Big Theatre. Everyone has heard of the Russian Ballet Company, this is where the performances are held. At the moment, however this is being renovated and a new theatre has been built to hold the performances. About 10 minutes on from here we were at Red Square, the historic market square of Moscow. The square is surrounded by Lenin’s mausoleum to one side and the GUM department store on the opposite. 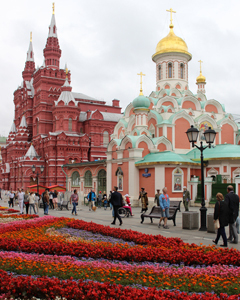 Saint Basil’s cathedral and The History Museum are at opposite ends. You can also see the walls of the Kremlin and a clock tower. My tour finished at Arbat St. A pedestrian street now famous for souvenir stands, many restaurants and cafes. The famous Russian author Alexander Pushkin’s house is also located here. It is now a museum dedicated to him and other Russian literates. For my last day in Moscow I got the metro back into the city area and went into the Kremlin. This is a city within a city. To enter you cross the stone drawbridge known as Kutafya Tower. Inside there are government buildings, historic cathedrals where Tsars were crowned, the Tsar’s cannon, which was never fired, the Tsar’s bell and gardens. Adjacent to this and a separate ticket required, is the Armoury. Contrary to what the name suggests, no armour is held here. It is the old weapons store and the most secure building in the Kremlin. The armoury now houses the priceless treasures of the Tsars. This took up a good 4 hours. I headed back to Arbat St for some lunch and a look at Pushkin’s house. There are many more art galleries and museum in Moscow, but I had a train to catch to get to my last destination. After a late dinner at the hotel, I went to Lenningrad station to board train number 53. This was an overnight train to Saint Petersburg. I arrived early morning with my driver waiting I headed to my hotel for a sleep before my orientation tour of the former capital of Russia. I think Saint Petersburg is the cultural capital of Russia. There are many ballet theatres, art galleries, and libraries in Saint Petersburg. This city was home to many famous Russian authors such as Fyodor Dostoyevsky, Alexander Pushkin, Anton Chekov, Leo Tolstoy just to name a few. 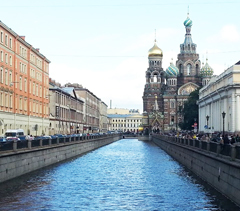 Saint Petersburg is built like Venice, on many canals. There is the main river – Neva that cuts the city in half. On the north side is the Peter and Paul fortress and the Cathedral where all the Romanov Tsars and families are buried. There is also a viewing platform here that gives you a panoramic view of the city. The most grandiose building in Saint Petersburg is the Winter Palace and the Hermitage. It was built by Catherine the Great and was the residence of the Romanov familes. 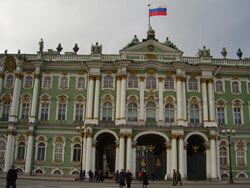 The Hermitage was built next door to house the grand art collection of Catherine the Great. It has only been on public view for the last 10 years. Other important buildings include the Cathedral of the Spilt blood where Alexander the 2nd was assassinated and St Issac’s Cathedral where Imperial ceremonies took place. The art square is the place to see the Museum of Fine Arts and other theatres. A statue of Pushkin stands in the middle of this square. 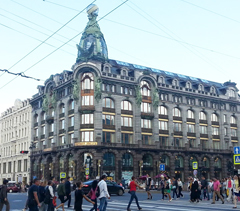 The place to hang out is Nevsky Prospekt. This is the main street that runs through Saint Petersburg. There are bars, cafes and restaurants a plenty. Finally it was time to leave and my hosts dropped me at St Petersburg airport for the flight home. 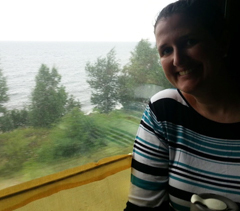 The Trans-Siberian Railway is one of the great journeys of the world and I thoroughly enjoyed the trip. These destinations are not for everybody however. Western concepts of service & reliability are not recognised in China, Mongolia & Russia. If you accept and enjoy the idiosyncrasies however you’ll be enchanted. Sure I would have preferred to travel during the northern summer but the trains, and life in general, go on all year round.